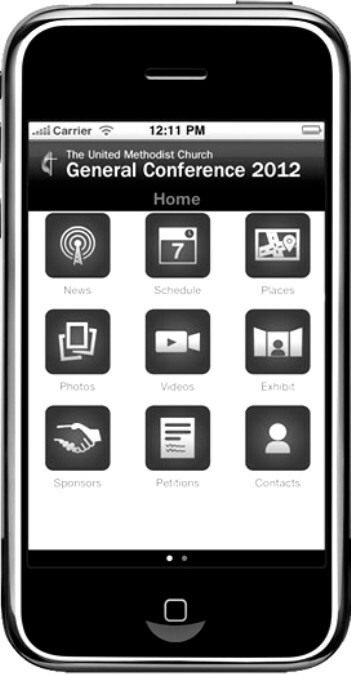 Those interested in following the 2012 General Conference of The United Methodist Church while on the go can now do so thanks to a new, free mobile app from United Methodist Communications. Mobile device users employing the iOS (iPhone, iPad, iPod, iPopular, iEtc.) and Android platforms can download the app from the iTunes App store, Google Play (formally the Android Market) – just search for United Methodist General Conference – or by visiting the umc.org General Conference Mobile App page. The app was developed in order to give users instant access to General Conference information without the need for a computer and Internet connection. Features of the mobile app include scheduling, legislative tracking, a map of the Tampa Convention Center and surrounding areas, information about display areas, news, photos and videos. Also, if you missed it late last fall, a separate United Methodist app was released in October with daily devotions, news, videos, photos, social media sites and a searchable index of United Methodist churches by geographic area.